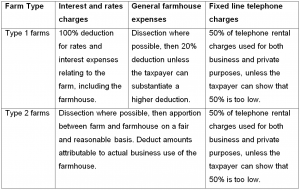 Rural clients need to be aware that Inland Revenue has released an Interpretation Statement for the deductibility of expenditure relating to a farmhouse that forms part of a farming (or orchard) business. As the statement applies from the beginning of the 2018 tax year, it affects what is being claimed on GST returns that are being processed now. Essentially, a farm must determine whether it is a Type 1 farm where the value of the farmhouse including curtilage is less than 20% of the total value of the farm. All other farms will be Type 2. The values may be determined by a formal valuation or by a reasonable estimate of the values of the farmhouse and farm. The following table summarises the practical approach outlined by Inland Revenue. Please let us know if you need further guidance on the deductibility of farmhouse expenses for your property.